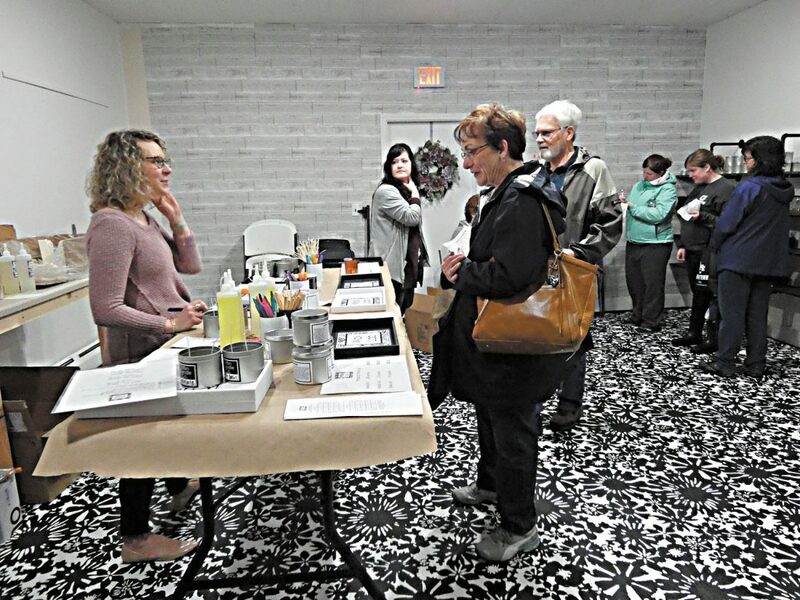 Chelsea Bilger (left), owner of Tiffin Candle Company, speaks with guests about “Wax Lab” at Simply Susan’s, 70 S. Washington St., during the 2019 Downtown Chocolate Walk Saturday afternoon. Simply Susan’s and Tiffin Candle Company debuted a new experience-based business during the 2019 Downtown Chocolate Walk Saturday. According to a Tiffin-Seneca Economic Partnership release, Simply Susan’s and Tiffin Candle Company partnered to create the “Wax Lab,” a “first-of-its-kind in Tiffin, experience-based business” at the Simply Susan’s store, 70 S. Washington St.
Chelsea Bilger, owner of Tiffin Candle Company, said the Wax Lab is an extension of Tiffin Candle Company’s offerings and uses the same wax and scents. She said the Wax Lab is to allow people to pour their own candles from a variety of scents and even create a custom label. About 40 scents are available and customers can use one scent, or mix and match them, Bilger said. She said the process to pour the candle takes about 30 to 45 minutes and it takes about 60 to 90 minutes to cure. Bilger said people can explore downtown in the meantime or they can pick their product up the next day. “It’s another activity we have to offer in downtown Tiffin,” Bilger said Saturday afternoon. Susan Wilkinson, owner of Simply Susan’s, said as a small business owner, you can’t just stay in one place. She said she’s always thinking of what to bring in next. “This just kind of fell into place,” Wilkinson said Saturday afternoon. In the release, Bilger stated that she’s excited for this next chapter of the business. Tiffin Candle Company has been in operation for about a year and has expanded to Fostoria, Findlay and Lakeside. “This has been such a fun experience, so I’m excited for Wax Lab to take off next,” she said. Prices start at $22 and appointments can be made in advance by contacting Simply Susan’s, but walk-ins are also welcome, the release states. Wax Lab is to be available for events such as birthday and bachelorette parties. Plans include seasonal scents and incorporating with other events in downtown, including Third Thursdays, it states. The Wax Lab is to officially open for business today. Bilger said the Wax Lab is to be open 11 a.m. – 6 p.m. Thursdays, 11 a.m. – 4 p.m. Saturdays and 12:30 – 3:30 p.m. Sundays, but there are a few dates they won’t be open. To schedule a party or group to come in and create candles, call Simply Susan’s at (419) 443-0882.